Do you ever have half square triangles left over from a project? Or do you just love to make them but aren’t sure what to do with them? Well I have answers to both. 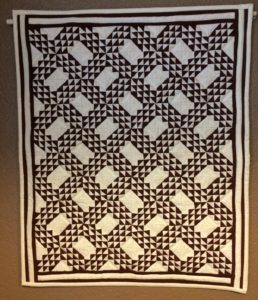 This week’s focus is on quilts made from HST – Half Square Triangles. I have usually made them with Thangles or some sort of paper pieced method. But I have to tell you about the newest discovery I have found at Wooden Spools. 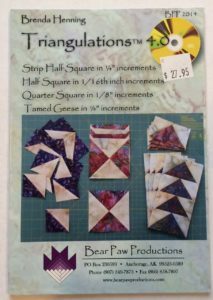 It is a CD by Brenda Henning, called “Triangulations”, that allows you to print a sheet of these in every size from ½” up to 7 ½” in 1/8” increments! That way you can make them exactly the size you want and print as many as you want. I don’t mean to sound like a commercial but this is the best tool I have added to my quilt studio in a long time! Ok – so here are just a few ideas to get you thinking about what to do with all those wonderful HST. 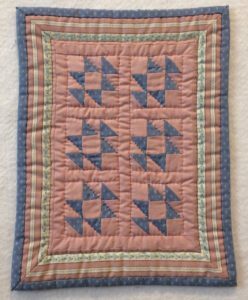 The first little quilt is made from “leftovers”. I made a nice sized quilt for our dog and used snowball blocks which left me with all these extra triangles which I made into pinwheel blocks. The next one is a little miniature using ¾” HST and solid pink squares to make up blocks called “Old Maids Puzzle”. The six of them are put together and bordered with a nice stripe fabric to make a charming little quilt. Can you guess what decade this came from? (Hint: remember the mauve and slate blue era of the 80s?). 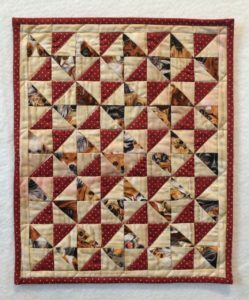 One of my favorite quilts is one I made in 2014 for the AQSG challenge to make a miniature reproduction of a quilt from the civil war era. I happen to own a family quilt that has been handed down from this era and is a full size in brown and cream. This reproduction is made up of over 2,000 little pieces. The HST are ½” finished and the entire quilt is 16 ¼” x 22”. It took me several months to make all the little HST (with paper foundations!) and put them together into this “Ocean Waves” pattern but it was an amazing connection to my aunt – 5 generations removed – specially to think about her most likely making the full-size quilt by kerosene light at night. She certainly didn’t have the same tools to create the original quilt as we modern day quilters are privileged to have. 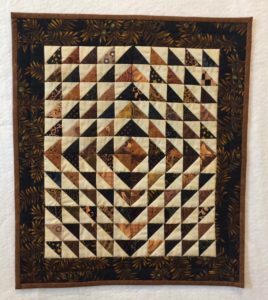 One more inspiring quilt I want to share is also made from HST in my favorite black, brown and cream colors. It is simply put together with the cream points going out and the black and brown points coming together in the middle.